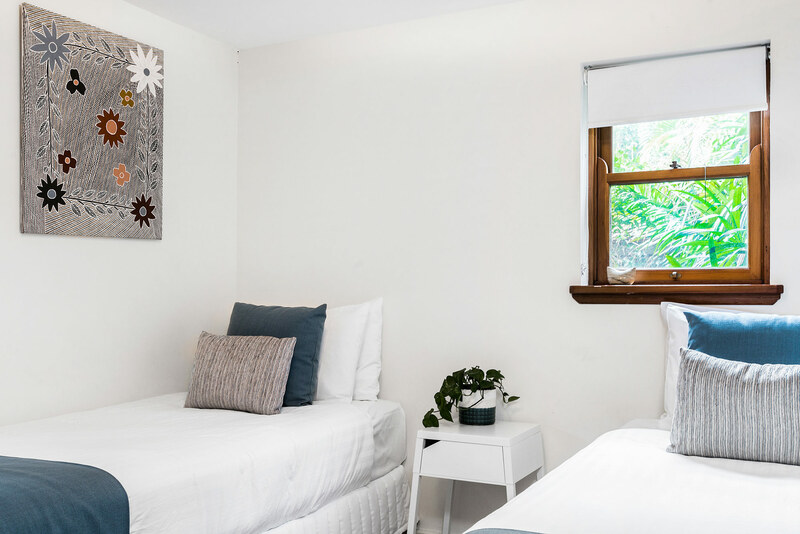 The Byron Blisshouse offers multiple accommodation options directly across the road from the beach at Belongil Beach, great for extended families and friends wanting to stay together but also have their own separate space. 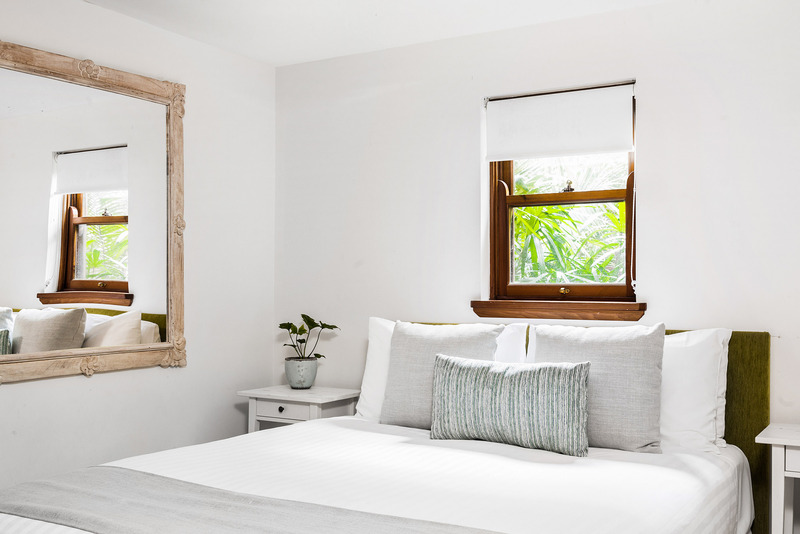 The whole space including the penthouse, garden villa, and studio can be booked together to accommodate up to 14 guests, or each section can be booked separately. 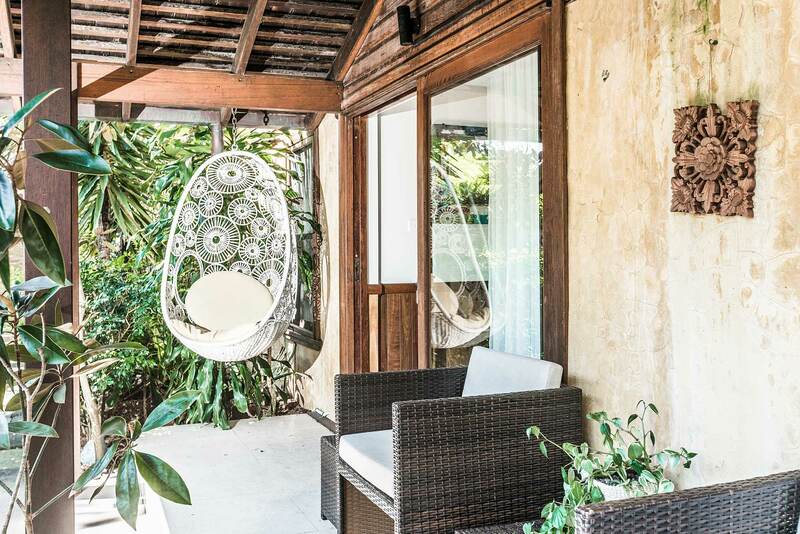 The whole property offers lush tropical gardens for a haven of privacy, and is fully fenced with separate entrances and gates between each section. When the whole property is booked, the internal gates are unlocked to provide easy access to all guests. Pets are also welcome (subject to approval and special pet friendly terms and conditions) when the whole property has been booked. The elegant two-storey, three-bedroom Penthouse is open, light and spacious. 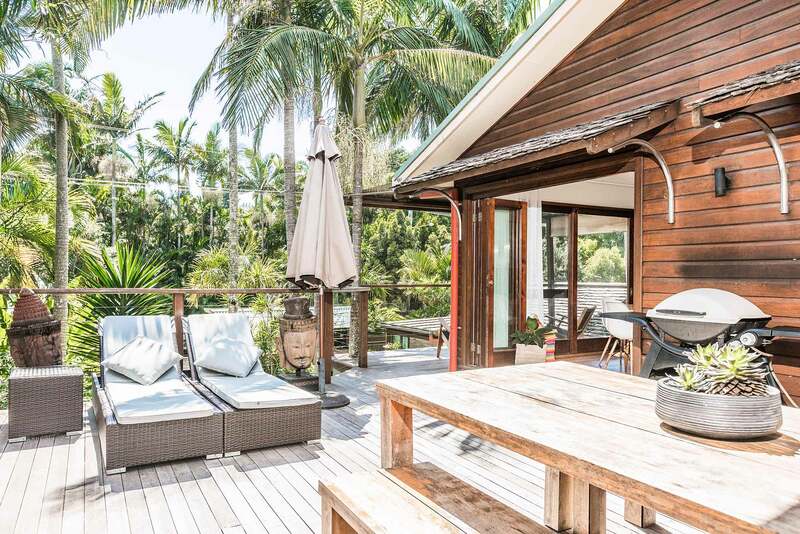 Its contemporary open plan kitchen and living area is surrounded by large sun-drenched timber decks, multiple entertaining areas, barbecue and plunge pool. The master loft bedroom features a queen bed and ensuite with french doors opening up onto a private balcony. The second bedroom has a king bed with ensuite. 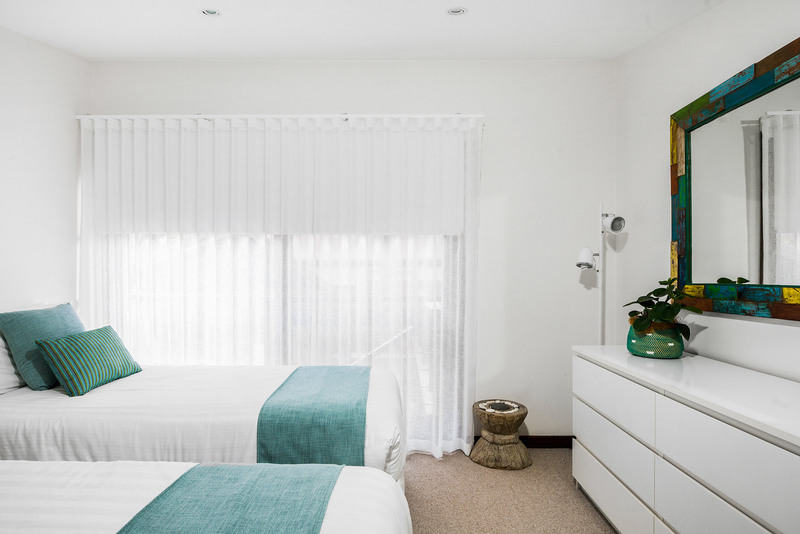 The 3rd bedroom over looks the pool area and has 2 twin singles that can be made together as a king. There is a 3rd bathroom for guest convenience. The romantic ambience of the Penthouse makes it particularly popular with couples and honeymooners. It is also a perfect place for a family or couples holidaying together and accommodates up to 6 guests. The deluxe three bedroom Blisshouse Garden Villa is an intimate space ideal for couples or small groups. 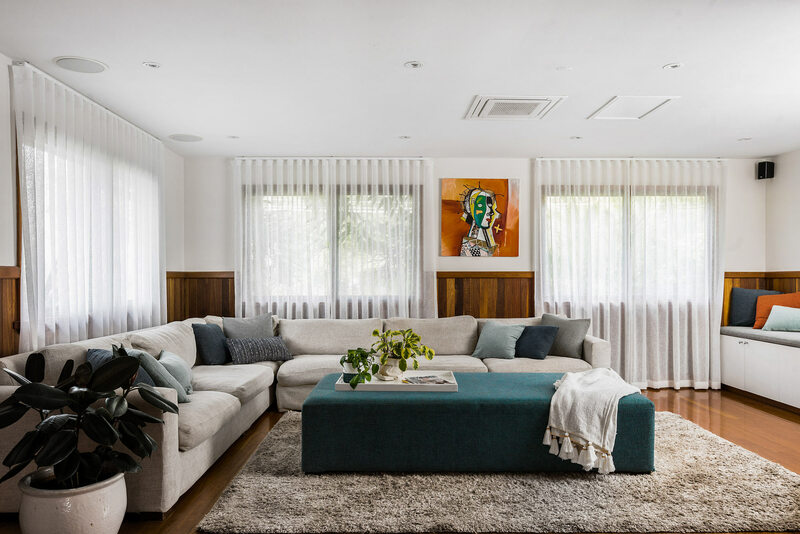 Its open plan living area, well-equipped kitchen, BBQ and shaded patio are fringed by a tropical oasis, providing alfresco living and lounging options. 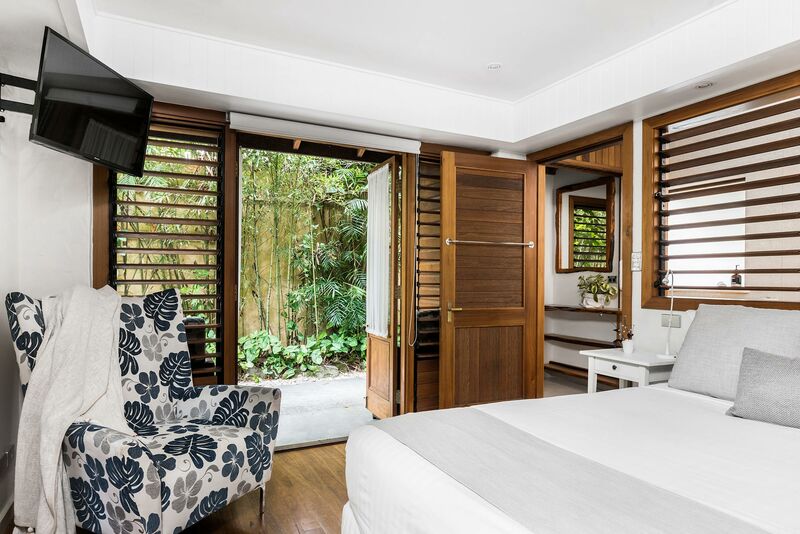 The master bedroom features an extra touch of luxury with its double-spa bathroom and French doors opening on to the exotic gardens. 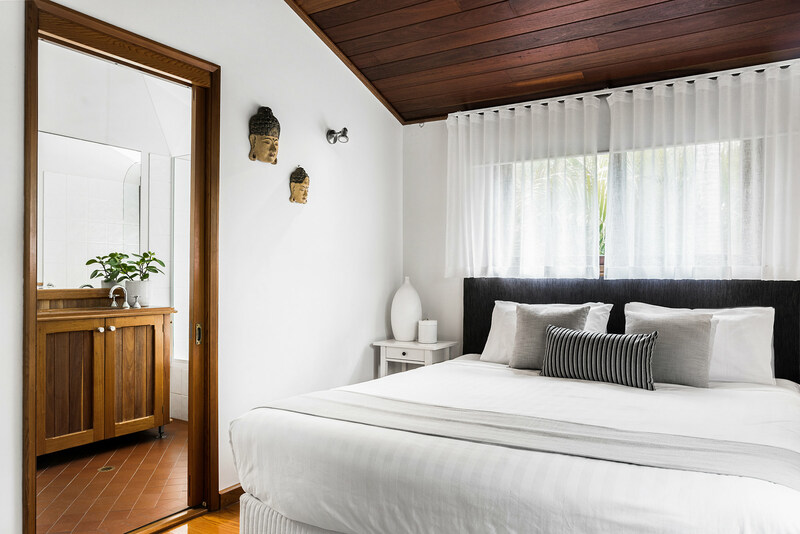 The villa includes a second queen sized bedroom and a third bedroom in luxury style accommodating twin singles (can be made as a king if preferred). This recently refurbished studio has been fitted out with quality modern appliances and furniture, and offers basic cooking facilities in the kitchenette. The studio has a plush king size bed with superior bedding making it cosy for those nights in watching a DVD. The bathroom has a full marble shower room and separate toilet & vanity area. The studio has a grassed fenced courtyard with hot and cold outdoor shower - convenient for rinsing off after the beach. A BBQ is supplied for your cooking enjoyment. Byron Blisshouse is ideally located across the road from locals favourite The Treehouse which provides wonderful wood fired pizzas and a great vibe perfect for friends and families. Their relaxed indoor/outdoor flow makes it suitable for dogs to sit alongside guests when seated outside. Belongil Bistro is also only a few doors away and is fantastic for coffee, breakfast and lunch. Belongil Beach and the pet friendly section is located across the road from Byron Blisshouse and is great for families and surfers. 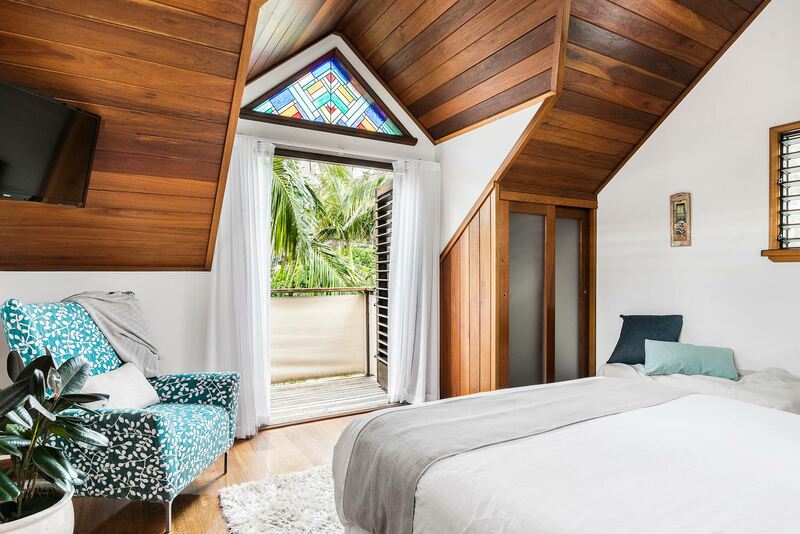 With this location and stunning property, guests can be as lazy as they please or for the more adventurous, can stroll into town via the beach and spend hours immersed in the best that Byron has to offer. 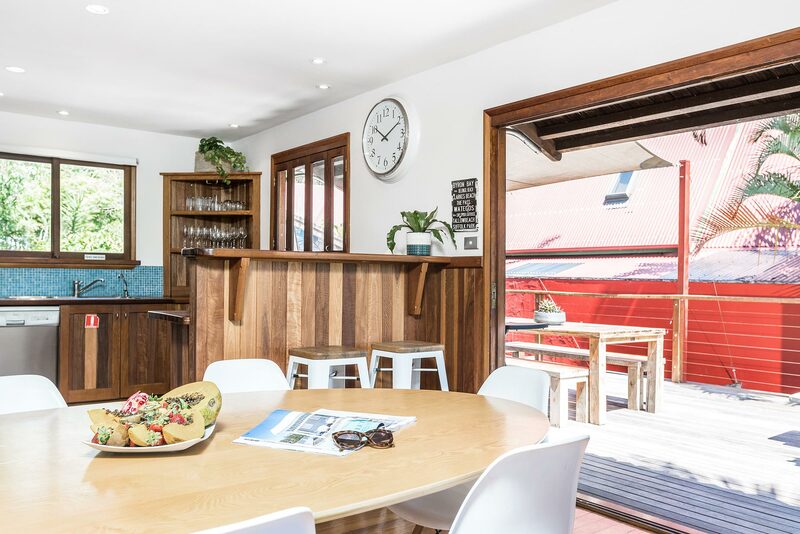 Group restrictions: Maximum of 8 adults at the property unless otherwise approved directly with A Perfect Stay/Byron Bay Holiday Rentals. If dates include both Christmas Day and New Year's Eve a 12 night min stay applies. Perfect for having a birthday celebration. We liked the tropical interiors and the close proximity to the beach. Aside from that, the entire complex was well maintained for our large group of friends. House contained all required facilities to make our stay enjoyable. 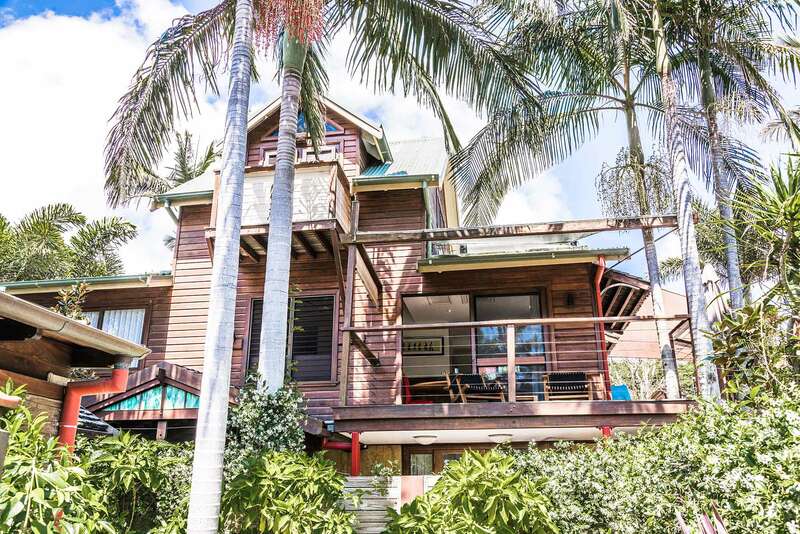 Honestly didn't want to leave Byron Bay because of Byron Blisshouse! 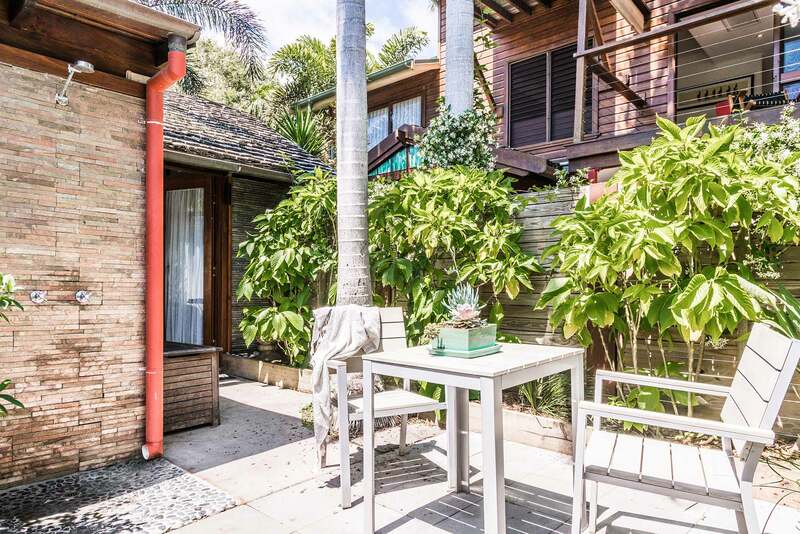 Wanting to escape the busy streets and bars of Byron Bay, we head to this beautiful holiday home just five minutes drive from the centre of town. Immediately the vibe changes; especially when we hear the breaking of the waves and the quiet laughter of caf goers nearby. 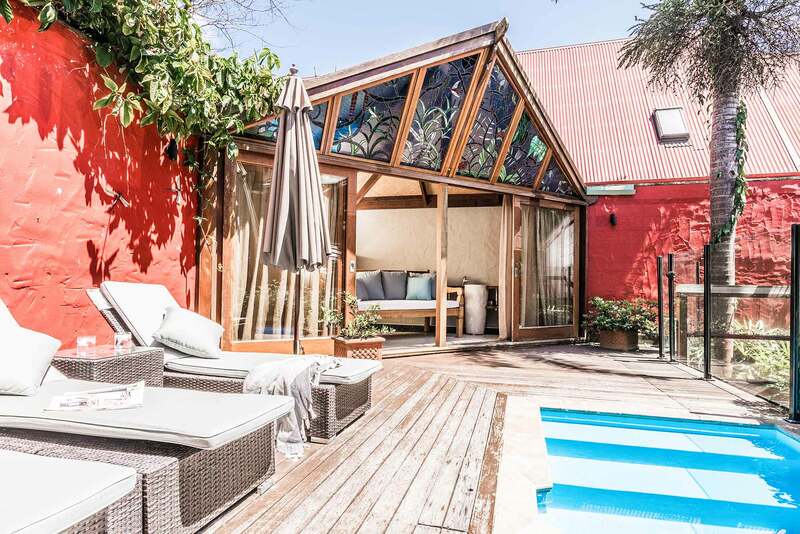 The whole property consists of three separate properties that can be booked as a whole: the garden villa, the studio and penthouse (where we are staying). 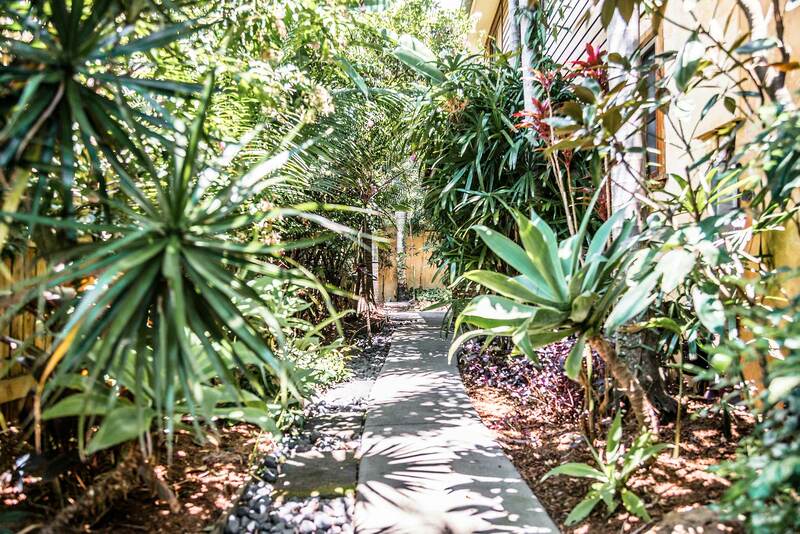 The surrounding gardens feel Bali-inspired. There are birds singing, the palm trees that offer shade to the large balcony, lizards sunning themselves on the stairs and the sound of the wind through the foilage. Its so relaxing. Inside, its cosy despite the fact the villa sleeps six, and the biggest couch I have ever seen borders the living room. Upstairs the master bedroom quickly becomes my favourite room. It feels like a luxury tree house, with views across the tree tops, a huge comfy bed and a beautiful bathroom. Before I venture out to the nearby Belongil Beach (an extension of Byrons Main Beach) , I cool down in the private plunge pool. With wet hair and a relaxed smile, I grab a smoothie from the local caf, the wonderful Treehouse on Belongil, and stroll to the beach. Its less crowded, with inviting waves and lots of birdlife. And the best part? Its only 100 metres back to my own private pool and personal treehouse.